E-mail hosting is a cost-effective solution for many businesses who desire a private email server that is safe, secure, and reliable. Instead of managing the expense and resources necessary to host your own email server in-house, today’s market allows for secure and efficient hosting of your email in the cloud, typically at significantly lower costs. But wait a minute, what if you have no idea what email hosting even means? After all, not all of us are techies. For business owners or entrepreneurs who don’t know what email hosting is, it’s an advanced online email service that rents out and operates email servers with premium features, such as higher email traffic volume and your own domain name (Example: Name@YourDomainName.com). An established domain name is very important to businesses because it gives the impression that you are an established entity potential clients can trust. So what’s the benefit of choosing email hosting over free email providers? There are many other benefits to email hosting services than just a unique domain name. 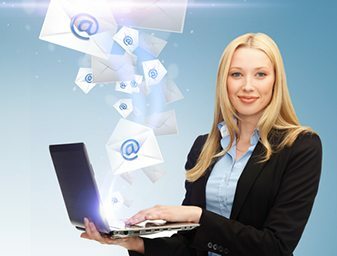 Email hosting services provide better technical support, security, as well as premium tools such as shared calendars and other collaborative options. For example, IMAP Support is an email hosting feature that allows you to download and use an offline email client to manage your inbox. Certain email hosting plans can also offer you additional cloud storage. Improved Security – Fully equipped data management centers, multi-engine Anti-Spam and Anti-Virus scanning and fully SSL end-to-end encrypted email transmission provide the security and peace of mind your business requires. Full Outlook Compatibility – Continue to leverage enterprise-level functionality including Shared Calendars, Global Address Lists, Tasks and Activesync with Outlook Web App and mobile devices, to collaborate between offices or around the world. Integration with Skype for Business – Allow users to easily and reliably collaborate through the use of Instant Messaging and Video Calling. Fully Customized and Hybrid Solutions – Full featured, dedicated single tenant to hybrid hosted Exchange/web only email solutions are available. Our email hosting packages are put together with your unique needs in mind, adapting our offerings to the size and features that benefit you most. With an array of options, our qualified experts will help you create the perfect combination of email hosting services without any unnecessary add-ons. From planning and deployment to everyday management, we’re here to help you succeed. Figuring out which service works best for you starts with a phone call. Simply dial 239-403-2950. SkyLink is run by certified IT Administrators and Engineers who are experts in their line of work. Eager to keep your data safe from digital intruders and Mother Nature’s worst? We take care of that. Our top-notch security and 24/7 surveillance is housed within a discreet location fortified to withstand the worst Florida has to offer. Click here to learn more about how we protect your data during a hurricane.